I wrote Trail of Broken Wings assuming no one would read it. When it sold I was sure its circulation would be five, maybe six, copies. Never did I imagine it would reach the heights of success it did. I was beyond grateful. With the success came scores of interviews and book club requests. Without fail every conversation turned to my childhood. Readers knew that many of the story’s emotions were drawn from my own experiences and feelings. They would repeat the same question: So your mother is your hero? Like in the story? I would pause, hesitant in my response. Yes, I would finally say. The answer felt foreign to my ears. My mother was my hero? How could that be when I spent my entire childhood angry at her? As in Trail of Broken Wings I am the youngest of three daughters. My mother had few options when I was growing up. My father was educated and our breadwinner. My mother had no means or ability to provide for three young children in a foreign country. With limited choices she had to accept our situation and the abusive life my father created for us. I resented her helplessness. In contrast, my friends’ mothers seemed stronger. They were professional women with degrees. They were partners with their spouses. They had a voice and it was heard. Sure my mother could do more, I became angry. I promised myself as a child I would never be her. I would be a stronger woman and a better mother. When I started to write Trail of Broken Wings, my editor, Benee Knauer, said the story didn’t feel complete without the mother’s voice. I hesitated, unsure if I could create an integrated, likeable character. How would any reader relate to a woman whom I was sure was so weak? Vacillating between my fiction and biographical hand, I tried to draw a complete character. Shocked, I found I was pulling the majority of behaviors and feelings from my own mother. The character I was creating wasn’t a composite of my mother but instead the real version. Strong, loving, kind and desperate to protect her children. What I had been unable to accept as a child I was starting to understand as an adult. My mother was as much a victim as my sisters and I. Yet, at every turn, she stood as strong as she could. She insisted we could forge a different path in our lives. She believed in us. She loved us. Unconditionally. But I learned the beliefs from our childhood are firmly implanted. One story couldn’t take away the years of hurt and sense of betrayal I felt. I couldn’t have been that wrong, I was sure. In many ways The Storyteller’s Secret is the prequel to Trail of Broken Wings. I wrote a piece years ago about how to sprout a story from a kernel of truth. It has been my modus operandi for my entire writing career. Take an event, minor or major, and create an entire novel or screenplay around it. Storyteller’s Secret came from the story of my grandmother who died tragically when my mother was two years old. An entire family was destroyed as a result of my grandmother’s untimely death. A stepmother, who would make Cinderella’s seem loving, dictated the course of my mother’s life. My mother was abused her entire childhood then forced to marry my father. Her life became one determined by circumstance. As I wrote Lena’s (my mother’s) story in Storyteller’s Secret I found myself crying. I hated what was happening to her and the choices that determined her path. Angry at fact, I resorted to fiction. In the story, my mother would be matched with someone who loved her unconditionally. She wouldn’t be broken by life but instead cherished. She wouldn’t be blamed by her fictional daughter but instead understood. I stopped, bewildered. The writer in me clearly empathized with my mother while I personally had not. I had demanded her fictional daughter show her understanding and yet I had failed to. I had held my characters to a standard I had fallen far short of. Ashamed, I grasped for a reason but there wasn’t a simple one. It’s difficult to explain the decisions of an adult when dictated by the beliefs of an inner child. Unsure, I turned to my mothering of my own children. With new lenses I saw what I couldn’t before – that I love them with the same fierceness and protectiveness that my mother loves me. Only at my mother’s insistence that I could be anyone do I have the freedom to express my love fully and easily. I am whole because my mother gave me everything she had. She showed me that love and belief in my children are the greatest gifts I can give to them. I am stronger because of her strength. 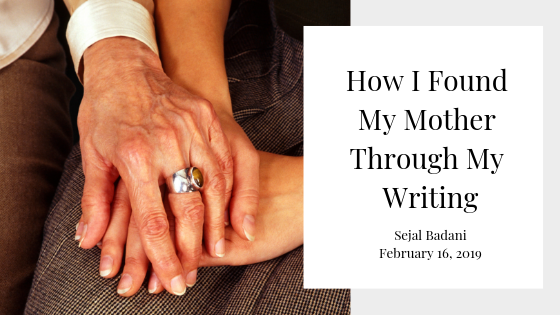 It has taken two novels and a complicated journey for me to see my mother for who she really is – my hero. I couldn’t be more grateful or love her more. Or, subscribe through your favorite feed reader!